Cranky knees and other joint pains are normal in the elderly and sometimes even in the young. While these pains are rarely life threatening, those who have them know the burden and effect on quality of life. In many cases, the cause is a loss of hyaline cartilage, which does not have the capacity to regenerate, meaning once gone it is gone forever. Hyaline cartilage is constituted of chondrocytes and its secretions, extracellular matrix (ECM) proteins, which includes collagens II and XI. They do not include collagen I, which is the primary collagen in fibrocartilage, or scar tissue. The key to a successful recovery then is to introduce into the deteriorated cartilage chondrocytes that secrete only hyaline cartilage ECM proteins. 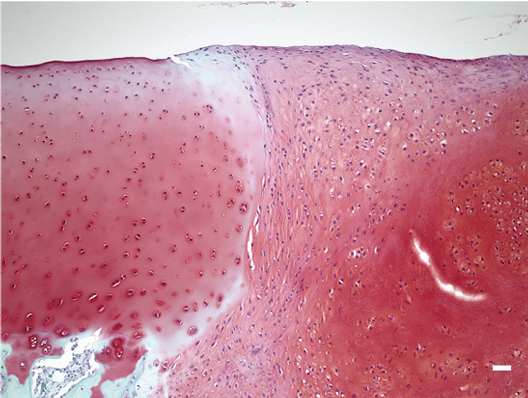 One of the most common strategies for treating hyaline cartilage damage is autologous chondrocyte transplantation. This technique involves acquiring hyaline cartilage from a biopsy and then transplanting it to the injured site. Because the biopsy is smaller than the area that needs repair, the chondrocytes must be expanded, a task that requires enzymatic digestion of the ECM proteins. Unfortunately, the expansion causes the chondrocytes to secrete collagen I, which is why the presence of fibrous tissue is inevitable after such operations. Thus, "the chondrocytes lose their chondrogenic properties", says Professor Noriyuki Tsumaki of the Center for iPS Cell Research and Application. To solve this problem, Tsumaki and his team report a new protocol that expands not chondrocytes, but iPS cells. When a sufficient number of iPS cells are expanded, the protocol then calls for the researchers to differentiate the cells into chondrocytes. Because these chondrocytes are differentiated directly from iPS cells, there is no need to digest ECM proteins, which avoids the problem of fibrous tissue and allows for only hyaline cartilage to be synthesized. Another advantage to this method is that it avoids the use of artificial scaffolds. In other studies on ES cell- and iPSC-derived chondrocyte transplantation, artificial scaffolds are included into the transplant to provide support until the chondrocytes begin secreting their own ECM proteins. 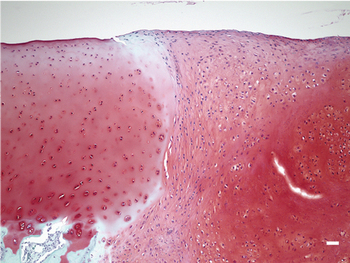 However, it is unclear if artificial materials prevent optimal integration into the cartilage. Because the chondrocytes have already begun secreting ECM proteins, they can be transplanted without scaffolds. This feature is attributed to the use of a suspension culture and medium that included BMP2, TGFb1 and GDF5 for six weeks. After this time, chondrocytes stopped proliferating and began secreting hyaline cartilage ECM proteins with high purity. 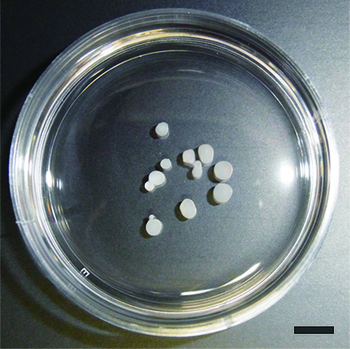 This mix of chondrocytes and ECM matrix proteins was harvested as particles 1-2 mm in diameter that could be directly transplanted into the injured tissue (Image 1&2). Each particle contained approximately 70,000 chondrocytes, which according to Tsumaki is good reason to believe enough cells for human transplantation is feasible. 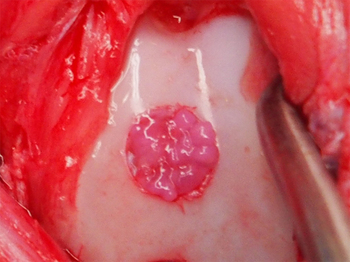 "One million chondrocytes are needed to treat 1 cm2 defects, and the area of a typical defect is 2-10 cm2. So, we are considering transplanting 30-150 particles. These numbers are quite manageable." The team transplanted their particles into three animal models: mouse, rat and mini-pig, finding positive signs for integration and maintenance (Image 3). These results have only encouraged Tsumaki. "These findings are only preliminary, but they show good indications of safety. The next step is to find the best conditions for transplantation in larger animals before we can consider patient treatment." Akihiro Yamashita, Miho Morioka, Yasuhito Yahara, Minoru Okada, Tomohito Kobayashi, Shinichi Kuriyama, Shuichi Matsuda and Noriyuki Tsumaki.?2015? Generation of scaffoldless hyaline cartilaginous tissue from human iPS cells. Image 1: Particles consisting of chondrocytes and their secretions, ECM proteins. 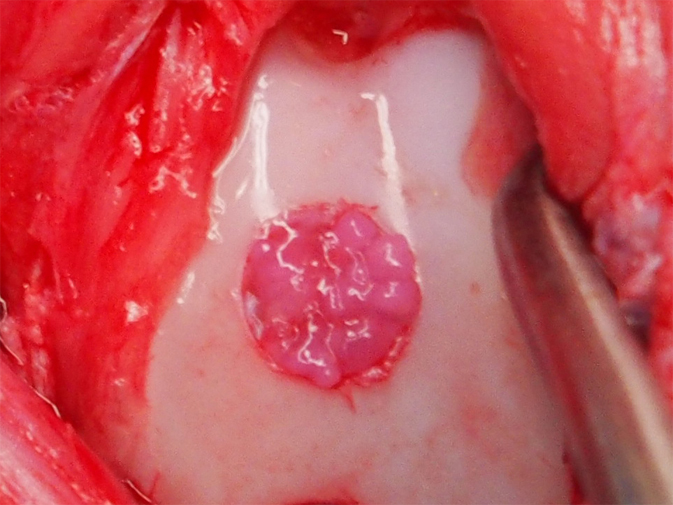 seen in the pinkish circle within the white cartilage. Image 3. Native (dark purple) and transplanted cartilage (light purple) in the femur. Dark dots indicate the nuclei of chondrocytes.